On June 27, 2016, the Supreme Court decided Whole Woman’s Health v. Hellerstedt, a case referred to as “the most significant abortion case to come before the court since 1992.” The case centered on the constitutionality of two provisions of Texas law HB2: first, an “admitting‑privileges requirement” which compels doctors who perform abortions to obtain admitting privileges at a hospital within thirty miles of the abortion clinic; and second, a “surgical‑center requirement,” which requires clinics to perform abortions in facilities that meet rigid standards. Since the passage of HB2, dozens of Texas clinics unable to meet the requirements were forced to close, severely hindering women’s access to abortion and reproductive health services. Similar laws, called TRAP laws, or Targeted Regulation of Abortion Providers, have been passed in twenty‑four states across the country. Nearly four months before rendering their decision, the Court heard oral arguments in the case. 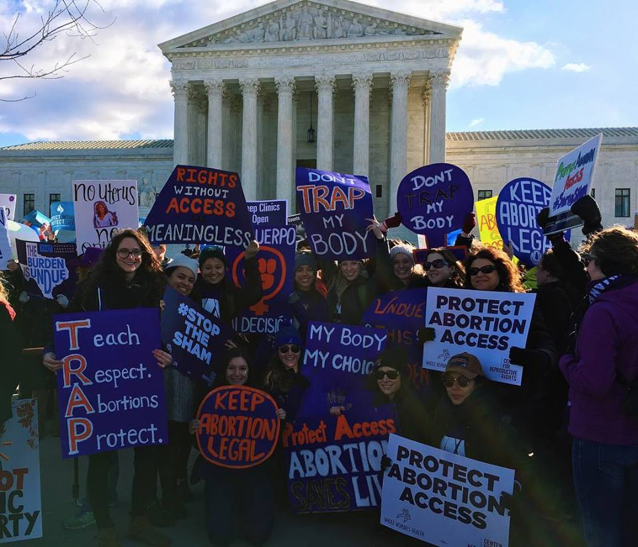 On that clear, brisk March day, thousands of people convened at the steps of the Supreme Court to rally in support of Whole Woman’s Health and voice opposition to Texas HB2 and other TRAP laws throughout the country. Eleven NYU Law students, all members of NYU Law Students for Reproductive Justice, attended the rally. Eight of the students gathered a week later to discuss what it meant, as law students and reproductive justice activists, to be at the Supreme Court that day, to reflect on the content and tone of the oral argument, and to consider the possible outcomes of the case and what the decision will mean for the future of reproductive health care access in the United States. Sarah Brafman: Why did we feel that it was important to take time away from class, in the middle of the week, to go down to rally outside the Supreme Court? Roxane Picard: Well, I didn’t grow up here. I grew up in Europe. I had an abortion when I was 19 in Scotland, where it’s free. I was in college in Chicago at the time, but there was no question that I would have the abortion elsewhere, what with the cost and complexity of the healthcare system in the United States. So, even though I am not a citizen and can’t vote in this country, I think it’s extremely important to advocate for these issues. It’s important to recognize that in the United States, a country that prides itself on protecting liberty and individual rights, abortion is not viewed as a fundamental right of women, and is not necessarily accessible. Madeleine Gyory: I felt that our presence at the rally as law students was really powerful. I’ve been at similar demonstrations in the past, but never armed with such substantial knowledge of an issue. Plus, we were representing an elite law school, a contingency that people respect. This made me feel both more present, and that our presence was more significant. Cathren Cohen: For me, the importance of going to the rally was that it brought in the activism side of the reproductive justice movement. It’s easy as law students and as lawyers to focus only on the court cases and the legal reasoning. While it’s an important part of the movement, I don’t think that the legal arguments can go all the way unless you also have activism and visibility bringing the issue to the attention of more people. Samantha Kubek: I completely agree. There is such a stigma about being vocal about your support or personal experience with abortion. Having a large group of people stand up and say, “I’ve been there before,” or “I support you for what you’ve been through” was powerful. This is such a huge moment in the history of reproductive rights that it’s important to bear witness and be vocal. Juliana Morgan‑Trostle: I wanted to go to the rally because I’ve lived in countries where abortion is restricted, and have seen the real‑life consequences of these laws. The women who live in rural areas, who don’t have health insurance, who can’t access clinics, are the ones who self‑induce abortions—and they’re often the ones who die as a result. And now, seeing those same trends in our country—the increasingly limited access to abortion—terrifies me. SB: As Cathren mentioned, as law students we can get so lost in the legal doctrine and analysis that sometimes we forget who we’re working for and who our clients are. Being at the rally was a reminder of the incredible people that we will represent as reproductive justice lawyers. Whitney Leigh White: There’s also a lot of pressure within the law school that strong, rational legal reasoning should be unemotional and apolitical. That pressure creates a gendered dynamic, this idea that rationality and emotion are separate and unconnected. In that way, my continuing commitment to activism while being a law student feels like a small rebellion against the idea that I’m not supposed to be approaching my law school career from a place of passion or personal connection to the issue. Amy Kwak: I also think it’s important to note how much more diverse the pro‑choice cohort at the rally was. It was a multiracial, multiclass, multi‑gender group, especially compared with the relatively skewed composition of the anti‑choice folks—mostly white, heavily male. That visual impact was really powerful. RP: As for the odd space of the rally, having had an abortion made it extremely personal. It can be very difficult to be in that space, where people are standing in a line in front of you telling you your choice was a murderous one. SK: I was surprised to see the anti‑choice signs at the rally because we’re accustomed to thinking of anti‑choice rhetoric as more akin to “abortion is murder.” Instead, I saw signs like “Women and children deserve better” and “Protect women, protect lives”—and if you put #prochoice at the bottom, those could be our signs. Witnessing anti‑choice rhetoric makes us better lawyers; the more you know what the other side is saying, the better able you are able to articulate strong arguments in your favor. CC: There were anti‑choice speakers there who are directly connected with murders and clinic violence. I found it chilling to see the side claiming to be “pro‑life” cheering for speakers who are associated with killing doctors. AK: There were a lot more pro‑choice ralliers than anti‑choice ralliers. And yet looking at the media coverage afterwards, you wouldn’t know that. That really frustrated me. We had almost three or four times as many supporters, but that wasn’t reflected in the media. That legitimizes the other perspective in a way that wasn’t borne out by our actual experience. MG: I’m in the Reproductive Justice Clinic, and we focus a lot on how to frame these issues in a way that speaks to people’s core value system. The anti‑choice movement has been skilled at doing that, by repeating, “we’re for life.” But the rhetoric we heard at the rally suggests that the anti‑choice movement has been pressured into changing their messaging, likely as a response to the strength of the pro‑choice rhetoric: “We want to protect women’s lives. We want to protect women, families and children.” Maybe they realize they have to change their messaging in order to maintain support. JM‑T: I was surprised to see David Daleiden walk down the steps of the Supreme Court and up to the podium. He is the force behind the “Center for Medical Progress,” which released videos filmed with hidden cameras in Planned Parenthood clinics. He was just indicted for attempting to purchase human organs and for tampering with a governmental record. SK: Having abortion providers speak to the crowd was a powerful counterbalance. For instance, having Dr. Willie Parker there was inspiring. MG: Don’t protect me so much that I have no choice. JM‑T: Exactly. And I was struck by the rally’s focus on providers—maybe because I lived in Argentina, where women who cannot access abortion have started using Misoprostol to safely self‑induce on their own. I was wondering, if what we really care about is access, then shouldn’t we also be helping women to gain access to these medications without the need for doctors? SB: We weren’t inside for the argument, but we have all read or listened to it. What was emboldening? What was worrisome? What are the possible outcomes, and which do we think is most likely? SK: I see the case going in one of two ways. First, I can see the Court remanding the case to get more information about clinic capacity. Given some of Justice Kennedy’s earlier questions, it seemed at times that he was looking for a way to remand, perhaps in the hope that when the case comes back up there will be nine justices. But Kennedy also seemed especially concerned with the idea that the Texas law causes abortions to occur later in pregnancies than they otherwise would. If that point sticks with him, which I hope it does, I could see Kennedy voting in favor of the clinics. CC: I want to emphasize the amazingness of the female justices. They didn’t play by the rules and challenged the factual premises of the law themselves. I’m thinking specifically of Justice Kagan citing the direct causal link between the law’s passage and the clinic closures. And Justice Ginsburg condemning the notion that women from Texas could go to New Mexico to access clinics there, pointing out that New Mexico doesn’t have the health requirements that Texas deems so essential. WLW: I was astonished by how much focus during questioning was placed on whether or not this law is actually closing clinics. It’s absurd that we’re having that debate. And the debate about whether or not the undue burden standard should be anchored to a real, legitimate interest—how could we have a standard that anchors this entire area of law, but that doesn’t require legitimacy in the state’s action? SB: Justice Kagan’s comment during the debate over whether the law really caused clinics to close was amazing. She said, “It’s almost like the perfect controlled experiment as to the effect of the law, isn’t it? It’s like you put the law into effect, 12 clinics closed. You take the law out of effect, they reopen.” And Stephanie Toti, the Center for Reproductive Rights attorney (and NYU Law alumna) representing Whole Woman’s Health, replies, “That’s absolutely correct.” Here you have the most brilliant legal minds in the country, and you need Justice Kagan to distill it down to a 1L doctrinal class about correlation and causation. WLW: At one point [Texas Solicitor General] Scott Keller tried to argue that the undue burden standard doesn’t have anything to do with whether or not the state’s interest is compelling or legitimate. He basically said the analysis should be purely about evaluating whether or not there’s a burden on women’s “ultimate decision to elect the procedure.” That phrasing was frightening to me, because it shifts the question away from whether women are actually able to get the procedure to whether or not they could make a decision to do so. JM‑T: I loved the questions from Justice Sotomayor, our wise Latina on the Court—which is particularly significant because this law is disproportionately affecting Latina women in Texas. My favorite part of the whole transcript was this exchange between Justice Sotomayor and Stephanie Toti. AK: That’s why personal passion and diversity are so important in the legal system generally, and in the reproductive justice movement specifically. It’s not just about us as law students. It’s about which of us will go on to be judges. It’s about who is going to be on the Supreme Court in fifty years. CC: I want to highlight one last amazing moment from the argument. Texas Solicitor General Keller was arguing that admitting privileges were necessary to protect women in case of health complications. Justice Ginsburg responded by pointing out that functionally, the provision will have zero impact. By the time a woman has a complication, she’ll be at her home, maybe 200 miles away from her clinic. So the fact that the clinic is within 30 miles of a hospital will not help her at all. SB: In our last few minutes, what do we think about the future? MG: I’m a bit pessimistic about the best‑case scenario occurring, which would be Justice Kennedy voting to strike down the law and overturning the Fifth Circuit decision. Even though some of his comments inspire hope, they were balanced by certain comments that weren’t so radical. I think we’ll more likely have a 4–4 split, or the case will be remanded for more facts on the ground—whatever those are. WLW: It deeply troubles me that the fate of something so important could essentially be in one man’s hands. That’s just not right—particularly as some of the things Kennedy has said in the past are very, very concerning. I’m thinking of his giving credence to the idea that women may come to regret their abortion, and that the Court should take that into account. I’m not going to dispute that some people may regret their abortions, but people regret all sorts of things. They regret getting married, and getting divorced, and having children, and moving across the country. There are millions of complicated decisions people make. No one has ever suggested that the legal standards for all of those decisions should be based on the possibility of future regret. AK: This whole experience has reminded me how, regardless of what legal steps we’re taking, there’s a much larger argument at play here—the moral argument. There were a lot of anti‑choice people at the rally talking about natural law. Even if we secure the right, even if we secure the access, as long as a woman has to justify her decision to get an abortion to someone else, we are placing a moral negative on the act. We are saying, “if you have sufficient reasons, then it’s alright for you to choose.” As long as that’s our framework, I think we’ve lost the moral argument. CC: We need to have people on the Court who have seen these issues play out in their communities and have a better idea of why these laws matter. People who understand the populations for whom getting on a plane and flying somewhere to get an abortion is not an option. The Court controlling access to abortion should be made up of individuals who understand the conditions of these women’s lives. WLW: This is a fundamental issue of equality. If you can’t control your reproductive decision‑making, you’re not going to be able to control your future. If we don’t see people as the authorities on their own desires and dreams and goals and families, on their own sense of morality, then we will never see true equality. True equality would mean not treating the subjects of these laws as lesser humans, without the ability or right to chart the course of their own lives. JM‑T: No matter what happens with the decision, the experience of being there, with all of you, and with eleven women from NYU Law, made me feel really hopeful. And I’m thankful to each of you for your compassion and your activism. 2. Jennifer Haberkorn, High court to hear ‘watershed’ Texas abortion case, Politico (Feb. 29, 2016, 6:16 PM), http://www.politico.com/story/2016/02/scotus-watershed-texas-abortion-case-219998. 3. Act of July 12, 2013, ch. 1, §§ 1–12, 2013 Tex. Sess. Law Serv. 4795, 4795–4802 (West) (codified at Tex. Health & Safety Code Ann. §§ 171.0031, 171.041‑048, 171.061‑064, 245.010‑011 (West 2015) and Tex. Occ. Code Ann. §§ 164.052, 055 (West 2015)). 4. Texas Abortion Clinic Map, Fund Texas Women, http://fundtexaschoice.org/resources/texas-abortion-clinic-map/ (last updated June 15, 2015) (listing clinic closure history due to HB2’s restrictions). See also Manny Fernandez, Texas Abortion Law Pushed Texas Clinics to Close Doors, N.Y. Times (Mar. 6, 2014), http://www.nytimes.com/2014/03/07/us/citing-new-texas-rules-abortion-provider-is-shutting-last-clinics-in-2-regions.html. 5. See, e.g., Brief for National Latina Institute for Reproductive Health et al. as Amici Curiae Supporting Petitioners at 12–14, Whole Woman’s Health v. Hellerstedt, No. 15‑274 (U.S. June 27, 2016) (discussing the increased cost, travel time, and inhibitors to accessibility, particularly for Texas Latinas), http://www.scotusblog.com/wp-content/uploads/2016/01/National-Latina-Institute-for-Reproductive-Health-CUNY-Law.pdf. 6. See Guttmacher Inst., State Policies in Brief: Targeted Regulation of Abortion Providers 1 (2016), https://www.guttmacher.org/sites/default/files/pdfs/spibs/spib_TRAP.pdf. 7. Whole Woman’s Health v. Lakey, 46 F. Supp. 3d 673, 682 (W.D. Tex. 2014), http://www.reproductiverights.org/sites/crr.civicactions.net/files/documents/WWH%20v%20Lakey_Memorandum%20Opinion.pdf. 8. Whole Woman’s Health v. Cole, 790 F.3d 563, 598 (5th Cir. 2015), http://www.reproductiverights.org/sites/crr.civicactions.net/files/documents/WWH-Fifth-Circuit-Opinion.pdf. 9. Whole Woman’s Health, No. 15‑274, slip op. at 2. 10. Transcript of Oral Argument, Whole Woman’s Health v. Hellerstedt, No. 15‑274 (U.S. June 27, 2016), http://www.supremecourt.gov/oral_arguments/argument_transcripts/15-274_l53m.pdf For audio of the argument see http://www.supremecourt.gov/oral_arguments/audio/2015/15-274. 11. The roundtable discussion has been edited and condensed. 12. See Jackie Calmes, Indictment Deals Blow to G.O.P. Over Planned Parenthood Battle, N.Y. Times (Jan. 26, 2016), http://www.nytimes.com/2016/01/27/us/politics/indictment-deals-blow-to-gop-over-planned-parenthood-battle.html. 13. See generally, Willie J. Parker, Op‑Ed, Why I Provide Abortions, N.Y. Times (Nov. 18, 2015), http://www.nytimes.com/2015/11/18/opinion/why-i-provide-abortions.html. 14. Brief for Historians as Amici Curiae Supporting Petitioners, Whole Woman’s Health v. Hellerstedt, No. 15‑274 (U.S. June 27, 2016), http://www.scotusblog.com/wp-content/uploads/2016/01/Historians-Pillsbury.pdf. 16. Transcript of Oral Argument, supra note 10, at 14. 23. See Notorious RBG, http://notoriousrbg.tumblr.com/ (last visited Apr. 3, 2016). 24. Janice MacAvoy, Op‑Ed, I’m a successful lawyer and mother, because I had an abortion, Wash. Post (Jan. 22, 2016), https://www.washingtonpost.com/opinions/im-a-successful-lawyer-and-mother-because-i-had-an-abortion/2016/01/22/d7dd75c6-c089-11e5-83d4-42e3bceea902_story.html. See also Brief for Janice MacAvoy, Janie Schulman, and over 110 Other Women in the Legal Profession Who Have Exercised Their Constitutional Right to an Abortion as Amici Curiae Supporting Respondents, Whole Woman’s Health v. Hellerstedt, No. 15‑274 (U.S. June 27, 2016) [hereinafter “The Lawyers’ Brief”], http://www.scotusblog.com/wp-content/uploads/2016/01/Janice-Macavoy-Paul-Weiss.pdf. 25. See MacAvoy, Op‑Ed, supra note 25. 26. The amicus brief filed by the over 110 women lawyers begins with that quotation. See The Lawyers’ Brief, supra note 25, at 3. For a photo of a rally attendee with a sign bearing that quote, see Center for Reproductive Rights (@reprorights), Twitter (Mar. 2, 2016, 8:57 AM), https://twitter.com/ReproRights/status/705014138997706752.